Are You Concerned About Exposing Your Child to 3D Technology? If you are planning to bring home that magical experience of watching 3D movies this holiday season, read this article first! Bringing 3D into your home means your children will be exposed to much more 3D than they would if they just went to the movie theater for a few hours. Learn about what you can do if your child is not 3D ready. This December we will have the opportunity to see Yogi Bear, Warner Brother’s newest 3D movie; 3D video games; 3D sports events on ESPN; 3D shows on Direct TV and the Discovery Channel; and glasses-free 3D in public places, as well as on phones and popular hand-held gaming devices. There are sure to be a lot of exciting 3D images to see, but many children will miss out on all the excitement if they aren’t 3D ready, and they will feel left out and different when they can’t see what everyone is talking about. The technology used to create the illusion of 3D images on the movie screen is different from that which is used for home 3D viewing and glasses-free 3D viewing. Nevertheless, they all require the viewer to use both of their eyes correctly. Whether you are in a movie theater or watching TV on your new 3D screen, you should still keep an eye out for any signs of a headache, nausea, or dizziness during or shortly after 3D viewing. It is recommended that you test drive 3D TV at your local electronics store before purchasing so you can watch your child to see if he can see the special 3D effects. Research shows that 4% of the population is stereo blind and another 25% of school-aged children have vision problems that may interfere with learning and seeing 3D comfortably. Typically children don’t know what 3D is, so parents need to know how to determine whether their child can see 3D or not. 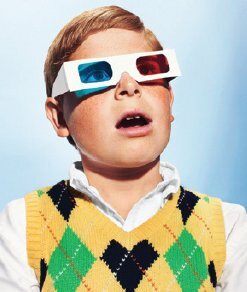 Consumer Reports May 2010 suggests that you see a developmental optometrist if you can’t see 3D. If your child has been diagnosed with Lazy Eye (Amblyopia) or an eye turn (Strabismus), they will not be able to see the full 3D effects. Most 3D movies provide visual clues, such as objects appearing smaller the further away they are, which any one can see whether they are using both eyes or just one. However, there are many special effects which do require that you use both of your eyes at the same time. As technology quickly advances to provide us with 3D ready TVs and 3D video games this holiday season, do sit back and enjoy the magic. But, if you or your child have trouble with 3D vision, any of the problems listed above, or a lazy eye or eye turn, remember that it is possible to learn how to see 3D. Optometric vision therapy has helped thousands of people around the world to be able to see 3D. To find out more about becoming 3D ready and optometric vision therapy, visit the College of Optometrists in Vision Development at www.covd.org, where you will find a special recorded Webinar, called School Crossings: A Neurobiologist’s View of How Our System Fails Children with Vision Problems. This interview with neuroscientist, Susan Barry, author of Fixing My Gaze, explores the magical experiences that she went through to go from being stereo blind to seeing 3D. Carole L. Hong, OD, FCOVD, board certified in vision development, has been practicing in San Carlos for over 15 years. She is an expert in children’s vision, vision and learning, and treatment of vision problems for those with autism spectrum disorders, other developmental disabilities, head injury, and stroke. Dr. Hong practices with Drs. Kristina Stasko and Macson Lee, also developmental optometrists. They can be reached at (650) 593- 1661 or email@familyvisioncare.org. Share the post "Are You Concerned About Exposing Your Child to 3D Technology?"